Mornings and I are not simpatico – we just don’t get along very well. I don’t know what it is, but I am NOT a morning person. On most days, I can’t even remember my own name before at least 10am. I spend most of my morning following him around prodding him to get up, get dressed, put CLEAN clothes on (am I the only one with a child who doesn’t care if he wears the same shirt three days in a row?? ), eat breakfast, gather up his backpack, put socks on, etc…And then it’s time to wake up other kids and get them going, and then hop in the car for carpool. So anything I can do to make mornings easier, then I’m all over it! 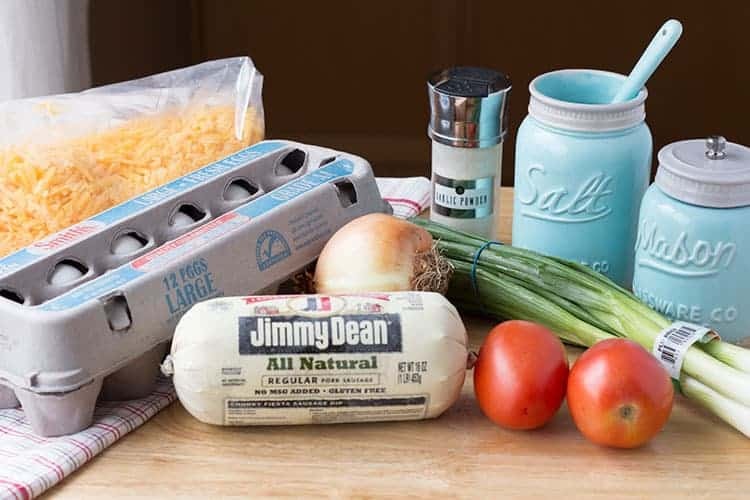 Having make-ahead or freezer breakfasts ready to means that breakfast is one less thing for me to have to worry about in the morning as we’re rushing around trying to get multiple kids ready for multiple carpools to multiple schools! You can customize these babies any way you like! Today, I’m using cheddar cheese, sausage, tomatoes and green onions. Bacon and Monterey Jack are some great options, too. 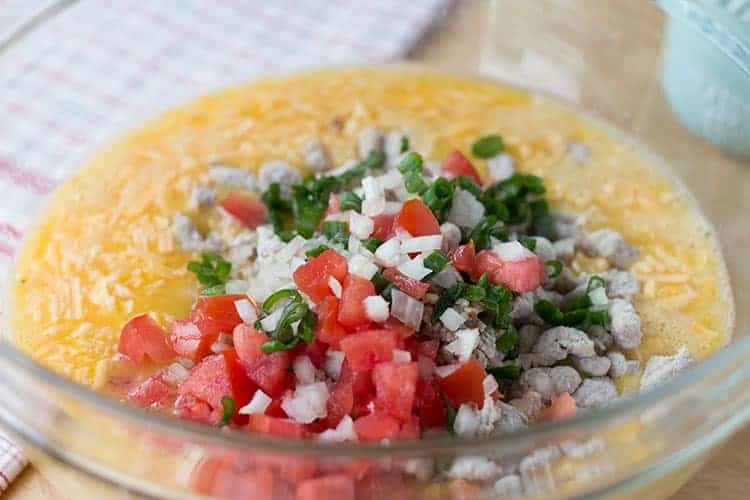 Or leave out the meats all together and just go cheesy eggs with some vegetables! For this make-ahead or freezer meal (because you can do both with this recipe), you’ll bake BEFORE storing or freezing. Stir in your salt, pepper and garlic powder. You could even add in some dried basil here, too, for extra flavor! Once you have all your seasonings incorporated, add in your remaining ingredients and stir to combine. 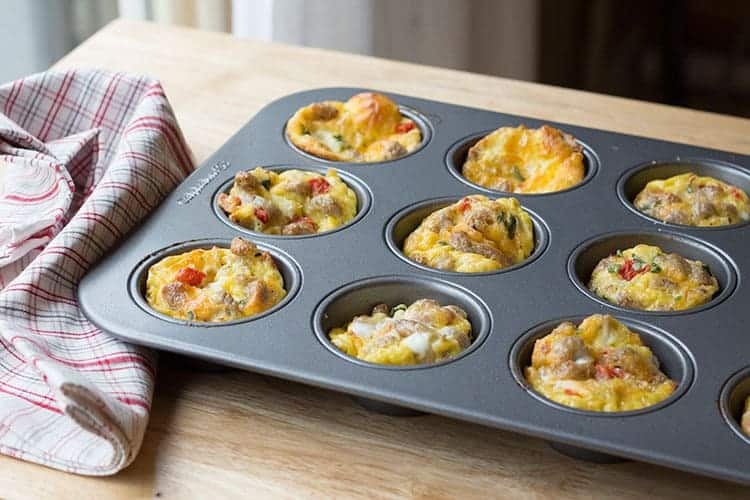 Spray a muffin tin with cooking spray, and then fill each muffin cup to about the 3/4 full mark. I found that using my 2oz disher (scoop) was just about right. 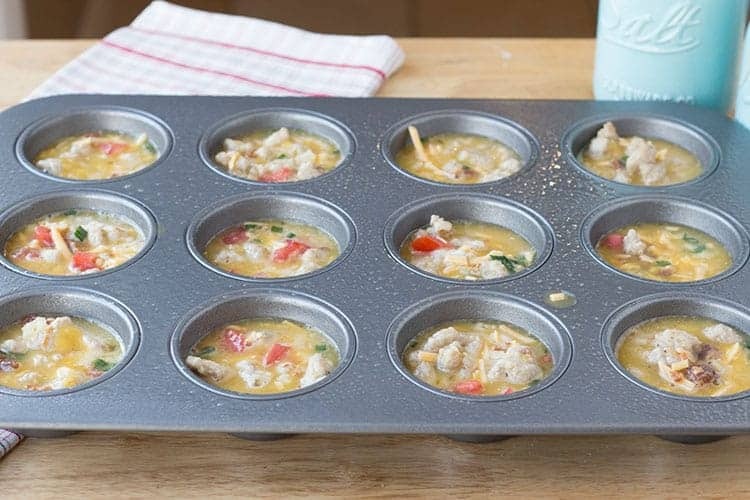 Bake for 20-25 minutes until egg muffins are fully set. They will puff up quite a bit in the oven, but don’t worry – they will deflate once you take them out. 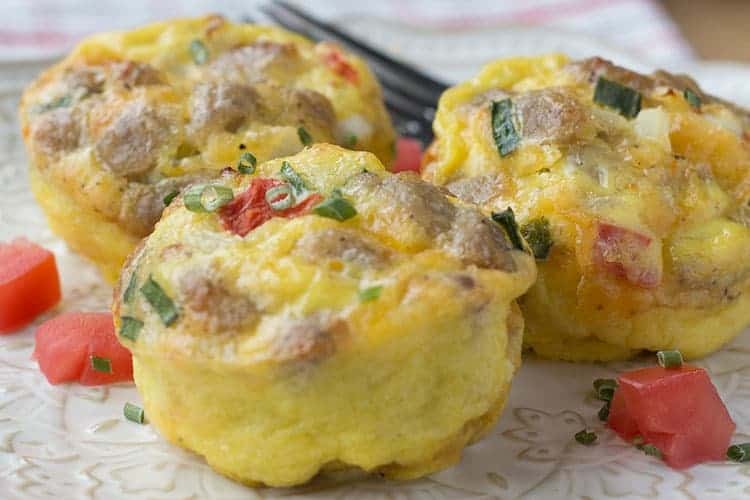 These are a great make-ahead option to help with busy mornings. And there is an endless variety of flavor combos to go with! Customize however you like them! Cook sausage in large skillet until brown and cooked through. Drain. 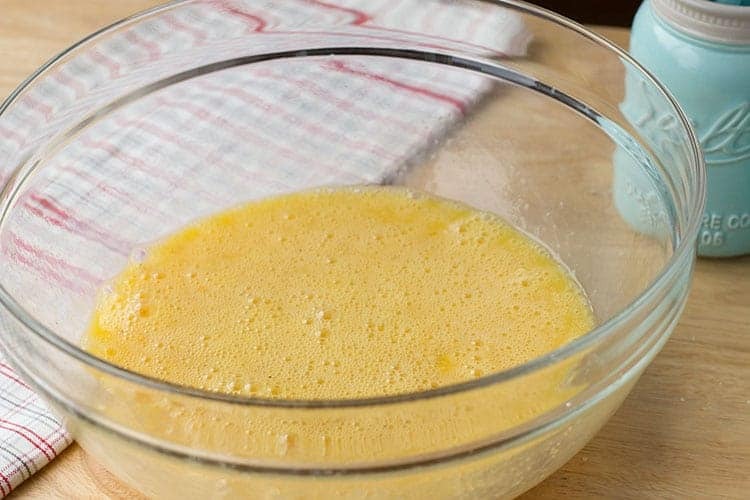 Crack eggs into a large bowl and scramble gently. Stir in salt, pepper and garlic powder. Add in sausage and remaining ingredients and stir gently to combine. Spray a large muffin tin with cooking spray. Fill each muffin cup about 3/4 full with egg mixture. Bake at 350 F for 20-25 minutes, until eggs are fully set. 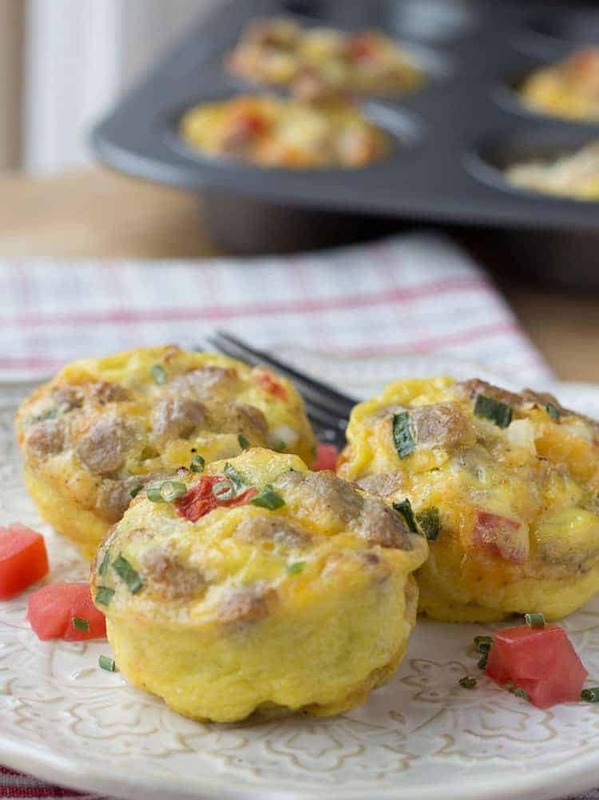 Store egg muffins in an airtight container in the refrigerator, or place inside gallon-sized freezer bag and freeze. To reheat from refrigerated: Microwave for 20-30 seconds until heated through. From frozen: Remove muffins from freezer and allow to thaw overnight in the fridge, either in a bag or other airtight container. Then reheat as above. I’ve got to make something like this for my mornings!! Right?! These are a lifesaver for my mornings. I tend to skip breakfast unless I have something that I can easily just grab in a minuter or two. I’m not awake enough to actually cook something. 😉 Two or three of these in the morning, thirty seconds in the microwave, and I’m full until lunch! I feel like I was just introduced to my new best friend. So easy, portable, AND full of flavor and nutrition! It’s the jack of all breakfast trades!